What a rich fall publishing season it has been – so many great books have come out in the last month or so and there are exceptional releases we are most eagerly awaiting. We’ve had a waiting list for this for more than a year and you can PRE-ORDER it now at our BookNotes 20% off discount. It will be, doubtlessly, the most important book of 2017. That it is about public and political theology makes it all the more needed these days. Don’t forget, we have a handy order link below that takes you to our secure order form page. Just tell us what you want and we’ll confirm everything promptly. There is also an “inquire” button which will allow you to send a private email to us here. Just let us know what you may want to know and we’ll reply promptly. Thanks for being in touch. Many of our best publishing partners – publishing houses that we stock most of their new titles – have done great books lately. For instance, we are thrilled to have all the new releases of InterVarsity Press, such as The Magnificent Story: Uncovering a Gospel of Beauty, Goodness, and Truth by a different James Smith — James Bryant Smith ($22.00.) We described it when it first came out, here. 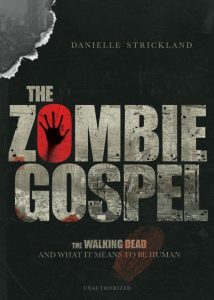 We’re excited by IVP’s thoughtful little book on “The Walking Dead” called The Zombie Gospel: The Walking Dead and What It Means to Be Human by Danielle Strickland ($13.00) and a lively new book called Empathy for the Devil: Finding Ourselves in the Villains of the Bible by JR Forasteros ($16.00.) Others have explored this material before, but I suspect no-one has done it as well as this new one. There’s some good buzz about it but since we just got it in, I can’t say much. We’ve long been fans of the great author Ken Boa – an eloquent and well-read author who writes about the Bible, about spiritual formation, and about apologetics. He has some great devotionals, some prayer books, and some books about the value of literature. I think our H&M friends should know him. 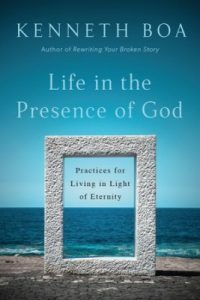 IVP just shipped to us a new one from Boa: Life in the Presence of God: Practices for Living in Light of Eternity ($17.00) which is brand new in their excellent formatio line. Looks great! 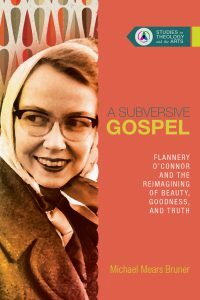 I have to give a shout out to the brand new release in their ongoing ”Studies in Theology and the Arts” series, the stunning work on the breath-taking, Southern Catholic literary figure, Flannery O’Connor called A Subversive Gospel: Flannery O’Connor and the Reimagining of Beauty, Goodness, and Truth by Michael Mears Bruner ($30.00.) Bruner is a professor of practical theology at Azusa Pacific, an ordained PC(USA) ministry and a resident scholar at Huntingdon Library. This is good stuff. 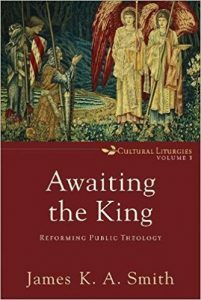 You will recall, I hope, that I gave serious attention last month at BookNotes to four really great recent releases of IVP. See our past reviews of White Awake by Daniel Hill, Vintage Sinners and Saints by Karen Wright Marsh, The God-Soaked Life by Chris Webb and the SPCK/IVP distributed release by N.T. Wright, Spiritual and Religious. There’s a reason we continue to stock nearly every single new book they do. These are exceptional books. Westminster/John Knox is another publisher whose books we consistently stock. We’ve already announced but are happy to remind you that Walter Brueggemann has a year-long, hardback daily devotional of all new reflections (that happen to follow the Revised Common Lectionary Readings for each day of Year B) called Gift and Task: A Year of Daily Readings and Reflections. It’s a nice hardback and sells for $20.00. WJK just released a new Advent devotional by Brueggemann for this year, too, called Celebrating Abundance: Devotions for Advent ($13.00.) We’re delighted they did a devotional for Year B Advent by N.T Wright, too, not surprisingly called Advent for Everyone: A Journey with the Apostles ($16.00.) We’ll tell you more about those as the holiday season draws closer. Although I need to give it a fuller review I could hardly put down the WJK title called Still Christian: Following Jesus Out of American Evangelicalism ($16.00) the moving and important memoir of prolific author and public intellectual, David Gushee. You’ll learn about his early days as a young evangelical, his journey through Christian higher education and becoming a professor within the ethics guild, his relationships with well-known leaders from his Fuller mentor Glen Stassen to Ron Sider to Al Mohler. David describes his own interior life, his marriage, the joys and sorrows of his family’s life, his moves into different quarters within the big tent of evangelicalism, the fallout from some key shifts in his thinking, and his obvious frustrations in recent years as a belligerent and less than intellectually engaging Christian Right has risen in popularity. 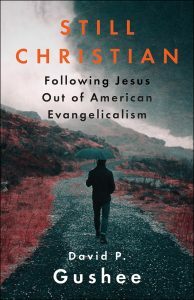 Stanley Hauerwas says it is a “must read for Christians and non-Christians so both kinds of readers will better understand the challenges of being Christian in this fearful time.” Gushee is now a Professor at Mercer University and a pastor of a small, ordinary congregation near there. One of the other lead titles from WJK that I’m eager to read is by John Pavlovitzn, apparently a well-known blogger and PC(USA) pastor. 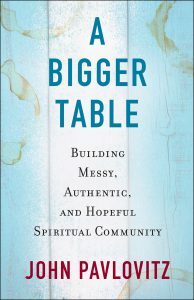 His book is nicely called A Bigger Table: Building Messy, Authentic, and Hopeful Spiritual Communities ($16.00) and we just got it in a week or two ago. There are a number of good books on hospitality and being a welcoming church and this looks like a big contribution to that field. Pastor Pavlovitz offers four marks of a bigger table community — radical hospitality, total authenticity, true diversity, and agenda-free community. We stock almost everything released by Abingdon Press and it’s difficult to try to pick just a few to describe. 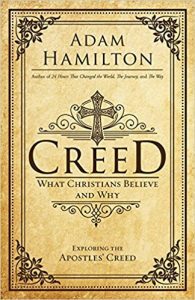 Of course there’s always a new Adam Hamilton book — just recently we’ve been promoting the book and DVD on John, another called Creed: What Christians Believe and Why and his book and DVD on Moses simply called Moses: In the Footsteps of the Reluctant Prophet. His new seasonal one explores in books and DVD the Christmas story through the eyes of Joseph; it’s called Faithful. A group in our church just worked through his clever book called Half Truths. For most of these there are stand alone books to read, DVDs, particpant guides, leaders guides, and often youth material, too. Just send us a note and we can give you good prices for Hamilton. See what I did there? Kudos to Abingdon for doing so many books about congregational life, pastoring, church health and the like. 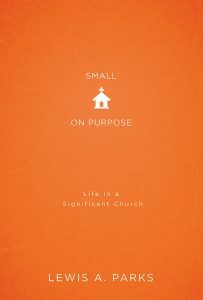 We were very glad to see a great new book for those in smaller churches called Small on Purpose: Life in a Significant Church by a great writer, Lewis A. Parks ($15.99.) We stock almost every book on this topic we can find, and this new one stands out. Rev. Parks is a prof at Wesley Seminary in DC and directs their DMin program there but lives here in Central PA, pastoring a United Methodist congregation. We’ve never met, I don’t think, but I liked his book a lot. If you know anyone in a smaller congregation, do let me know about it. Broadman + Holman recently released a compact little hardback called Sing! How Worship Transforms Your Life, Family and Church by Keith and Kristyn Getty ($12.99) whose substantive contemporary hymnody is well loved across much of the church. 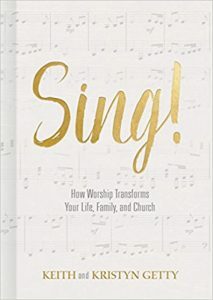 There isn’t enough on singing in the church and we are very glad to have this; it would make a good congregational study, an adult ed class book or good for choir members or worship committee members. I hope you know their work. 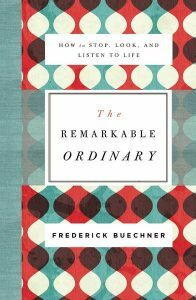 What a wonderful publishing event it is that Zondervan has offered the reading public two new books by Frederick Buechner! Yes, two new editions of books by Buechner! One is a collection of mostly unpublished and previously unknown pieces about finding God in the ordinary and the other is a collection of mostly previously published portions of books around the theme of coping with pain and hurt (although there is some new material there, too.) 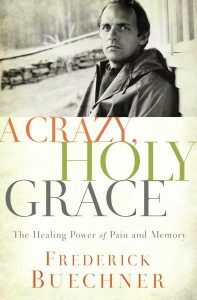 The first paperback is called The Remarkable Ordinary: How to Stop, Look, and Listen to Life ($16.99) and the companion is called A Crazy, Holy Grace: The Healing Power of Pain and Memory ($16.99.) Amazing, huh? More kudos to Zondervan for releasing a very handsome four volume cloth edition NIV “Reader’s Edition” (that is, nicely type set without any verse numbers for a more seamless reading experience) of the Bible that compares nicely to the exceptionally elegant four volume “Readers Edition” of the ESV that Crossway did last year. (The NIV four volume set, by the way, has the prophets grouped chronologically, making it both classy and helpful, and the New Testament grouped thematically.) 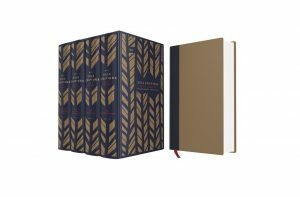 It is being called The Sola Scripture Bible Project ($99.99) and there is a handsome hardback one volume edition ($34.99) and two brown imitation leather styles ($49.99) as well. 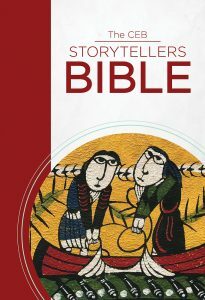 Abingdon Press, by the way, just released the large and interesting Storyteller’s Bible in their colorful CEB translation. It is big and thick with lots of storytelling ideas — the Bible is, mostly, a narrative, after all — and it sells in hardback for $39.99. We have more new Bibles than ever and love the idea of selling handsome editions of God’s Word. Give us a call if you want more ideas for what translation or edition might be right for you. Just released is the new Eric Metaxas biography of Luther published by Vicking and even though we protest his unconscionable politics, Eric is a lively and compelling writer and this big fat book called Martin Luther is certainly one of the most interesting reads of the season. It’s a bit pricey at $30.00 (although it is almost 500 pages and there are some full-color plates) but our 20% of helps. We’ll tell you more in our list of other books on Luther and the reformation in a column coming up soon. 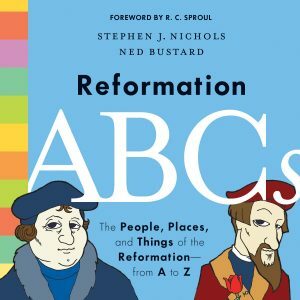 We’ve got plenty of stellar old ones and a dozen new ones to tell you about, from Crossway’s Reformation ABCs: The People Places and Things of the Reformation from A to Z (by Steve Nichols & Ned Bustard; $16.99) to a new translation of a splendid bestseller from Germany Martin Luther: A Late Medieval Life by Volker Leppin (just released by BakerAcademic; $22.99) to the important but critical work by Catholic Reformation scholar Brad Gregory’s Rebel in the Ranks: Martin Luther, the Reformation, and the Conflicts That Continue to Shape Our World (HarperOne; $27.99.) More on all that soon. Anyways, kudos to Waterbrook for occasionally offering out-side-the-box titles like Zahnd’s Sinners in the Hands of a Loving God from their evangelical headquarters in Colorado Springs. 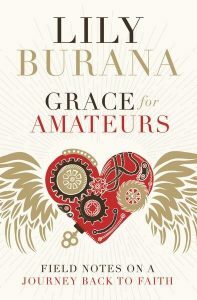 A quickie overview of the best Fall releases from standard publishers we represent would have to include All Things New: Heaven, Earth, and the Restoration of Everything You Love by John Eldredge ($24.99) and a soon-to-be shipped, edgy memoir by a former punk-rock girl who has been through it all, Lily Burana, called Grace for Amateurs: Field Notes on a Journey Back to Faith ($22.99) both from Thomas Nelson; Uncomfortable: The Awkward and Essential Challenge of Christian Community is an important book by Brett McCracken offered from Crossway ($15.99); I absolutely must name God’s Country: Faith, Hope, and the Future of the Rural Church by Brad Roth ($16.99) — there isn’t much for rural churches and this is brilliant and highly recommended — released from Herald Press; and a brand new, delightful little book on the Book of Common Prayer written by Lauren Winner called A Word to Live By ($12.00) which is volume 7 in the “Church’s Teaching for a Changing World” series by the Episcopal Church’s publishing house called Church Publishing; a new book by Nate Collins called All But Invisible: Exploring Identity Questions the Intersections of Faith, Gender, & Sexuality ($19.99.) Wesley Hill, who, like Collins, is gay, but holds to a fairly traditional view of what the Bible teaches about ordered sexual desire and marriage, wrote the forward about making space to actually listen to LGBTQ Christians and commends this book beautifully. It is published by Zondervan. 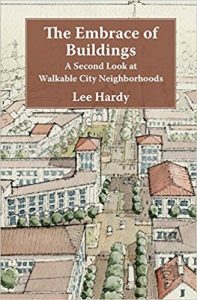 And, although it is a very small press, we are so, so glad to stock everything that is published by the Calvin College Press, such as their brand new book called The Embrace of Buildings: A Second Look at Walkable City Neighborhoods by Lee Hardy ($16.99.) It is spectacular, another reason this publishing season gives us such encouragement. What interesting, good, edifying stuff. What a joy to run a bookstore that gets to carry these kinds of titles by such thoughtful, talented writers. If you can’t find a bookstore that stocks these kinds of items, perhaps we can help. We’re looking for some new loyal customers and book-loving friends. But what I’m most eager to tell you about today is this: Eerdmans has long been one of our very favorite publishers and while they are respected as perhaps the premier house doing important scholarly Biblical and theological studies, some quite academic, they also do a lot of wonderfully conceived and well-edited volumes that are for what they like to call “the intelligent lay reader.” That is, they have stuff on discipleship or spiritual formation or cultural engagement that is a cut above some of the popular level religious literature and which demands a degree of open-mindedness and thoughtfulness in one’s religious reading. In other words, Eerdmans remains one of our absolutely favorite publishers, not only for their high-level academic stuff, but for their books aimed at the ordinary but slightly higher-educated bookstore customer. We think that most likely includes a lot of our best friends. For the record, they also have published some of the nicest looking book catalogs that we in the trade (and I suppose libraries and some academics) get to see. There are a few publishers who still do lavish quarterly catalogs (like University of Texas Press whose catalogs are a work of art!) 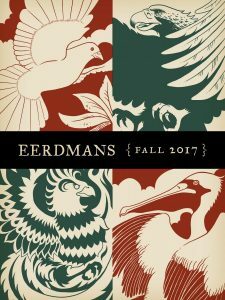 Eerdmans this season wins the award, if there is such an award, for the best-looking book catalog we’ve seen. They deserve credit too for any number of in-depth on-line interviews they have with their astute and often scholarly authors. Check out their book blog EerdWord, too, if you want to know more. Come back and order from us, though, even if they have dumb amazon links sometimes… they like indie bookstores, even if they don’t say so. We trust that many of our customers will enjoy hearing about this handful of 10 intriguing and even eccentric recent titles from this marvelous, storied, Grand Rapids publisher. We’ve got ’em all at 20% off, too. 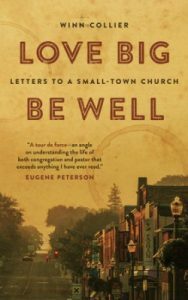 Love Big Be Well: Letters to a Small-Town Church Winn Collier (Eerdmans) $16.99 I start with this one because I believe it may be my own personal favorite book of the year. Really — I am that fond of it, and want to push it on everyone who cares about the life of the local church or the local pastor. It certainly is one of the best books I’ve read all year and without a doubt the best book about church and congregational life I’ve read in a long while. I can’t recommend it highly enough, no matter what your own congregational setting or theological context. It’s worth reading, I promise you. It is written rather like a novel, a creative approach that unfolds as a series of letters from a new pastor to his small, rather cranky, small-town Presbyterian church. The voice of this seasoned fictional pastor is eloquent and artful; the best way to explain it is to imagine if these really were letters from Eugene Peterson. This is a huge compliment to author Winn Collier, by the way; he’s a great, great writer. This book is a tour de force – an angle on understanding the life of both congregation and pastor that exceeds anything I have ever read. No directions, no programs, just an immersion into what really takes place in the life of a congregation and a pastor. Winn Collier’s writing is alive. 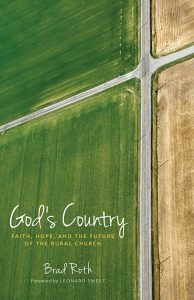 So, this is a beautifully rendered and entertaining story about pastoral theology, about a small town congregation struggling to be real and somewhat faithful, and about how they find God in the middle of the mundane stuff of ordinary life. My only complaint is that I wished for a bit more – but it isn’t a bad thing when you don’t want a book to end. 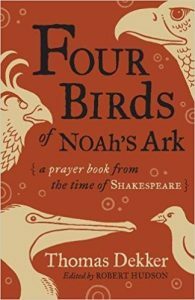 Four Birds of Noah’s Ark: A Prayer Book from the Time of Shakespeare Thomas Dekker edited with an introduction by Robert Hudson (Eerdmans) $17.99 This is without a doubt one of the most interesting and glorious books of the year, a surprising book that would make a great gift and a useful tool to enhance anyone’s prayer life. It is, in fact, a real, usable prayer book – and before you think it might be too old or weird, just think of the prayers of Thomas Cranmer, the primary author of this little resource called The Book of Common Prayer. This author was more or less contemporary to that era, and his book is considered a timeless but little-known literary classic. Four Birds of Noah’s Ark has been in print for centuries and then went out of print finally in 1924. Kudos to Robert Hudson (himself an editor and a poet, author of a poetry collection called Kiss the Earth When You Pray) for getting this remarkable book back into print and prepared and annotated in such a lovely, lovely format. This prayer book – designed very nicely with some color artwork and French folded flaps on the cover – was first written as the Black Death ravaged London in 1608. Dekker was a playwright and this volume offers fifty-six prayers for the people of London in their time of crisis. The prayers in Four Birds of Noah’s Ark are inventively organized into categories symbolized by four birds, a Dove, an Eagle, a Pelican, and the Phoenix. So the beautiful prayers in each section are grouped within four major themes, all useful and wise and good. Hudson has discovered the literary equivalent of buried treasure – in this case, lying hidden in plain sights – and brought it to light for our instruction and delight. Many thanks! Beautifully crafted, filled with human goodness and biblical truth, these are more than prayers: they are meditations, devotions, and little lessons on what it means to be human and utterly dependent upon God. This is a volume I will return to again and again. 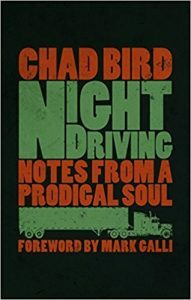 Night Driving: Notes from a Prodigal Son Chad Bird (Eerdmans) $16.99 When this book arrived I was about a third of the way through the thoroughly enjoyable The Long Haul: A Trucker’s Tales of Life on the Road by driver Finn Murphy, which is a pretty gritty memoir of a professional mover and semi-truck driver. I was so enjoying it, captivated by his talk about American roadways (including a fast food place in Colorado I’ve been in and including roads near us here in central Pennsylvania. Besides a good story, I liked Finn’s analysis of the truck driving life and sub-culture, and some of the wild-west myths the truckers promote about themselves. So when this Eerdmans book came – with endorsements by conservative spiritual writer Elyse Fitzpatrick and Presbyterian pastor John Ortberg – and I learned that the author cohosts a podcast on the Old Testament, I had to do a bit of a double-take. Wait, what? Journeys that begin in brokenness rarely follow a straight road to healing. 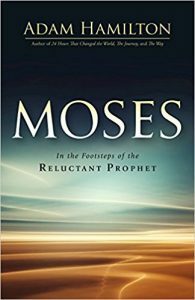 There are twists and turns – and setbacks – on the path of repentance. I sort of wish I could get a copy to Finn Murphy. 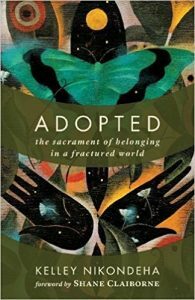 Adopted: The Sacrament of Belonging in a Fractured World Kelley Nikondeha (Eerdmans) $16.99 This book came out just a few weeks ago and has already garnered a bit of a buzz in the reviewing blog-o-spheres. It is beautifully written, covering some material that is on many people’s minds but which hasn’t been written about as widely or deeply as has been needed. It has a beautiful cover, has a great foreword by the colorful wordsmith and activist Shane Claiborne, and is, actually, the lead title in the Eerdmans catalogue. I think they are thinking this is one of the most important books of the year. Nikondeha has quite a story herself – she is both an adopted child and an adoptive parent, a white woman living in Africa with a bi-cultural and bi-continental family – and she has keen insights about deep and human questions about family, society, belonging. Obviously, she is interested in third world development, social justice, and offers a vivid critique of racism. Her vision of the family is deeply inclusive, generous, hospitable. She gets the “fractured world” part of her title and she wonderfully explains the “sacrament of belonging” which is what the book is really all about. Adopted is, on the face of it, about real adoption, one family taking in a child as a full member; she also, though, explores the theological notion of salvation as adoption (God adopting us into God’s redemptive family.) 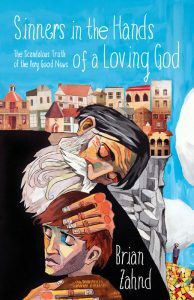 Nikondeha’s lovely and dramatic story and passionate insights about reconciliation point us to more deeply understand what it means that we belong to God’s family because of God’s inclusive grace. Part memoir, part theological exposition, Adopted: The Sacrament of Belonging in a Fractured World expands our understanding of what it means to be the family of God. As both an adopted person and an interracial adoptive parent, Kelley Nikondeha writes with transparency, tenderness, and racial awareness… This wonderful book will illuminate a path for all people to experience sacred relationships. 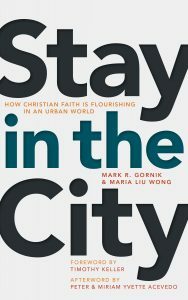 Stay in the City: How Christian Faith is Flourishing in an Urban World Mark Gornik & Maria Liu Wong (Eerdmans) $12.00 This is one of those little books that is so important to read – even if you aren’t called to the city, as most of us are not – just to know what is going on in the world, and just to spend a few hours with a theologically astute writer offering good and important news. Mark Gornick, I hope you know, wrote what we consider to be one of the most important contemporary books of social ethics and Christian perspectives in his magisterial and still vital 2002 volume To Live in Peace: Biblical Faith and the Changing Inner City. He also wrote the fabulous Word Made Global: Stories of African Christianity in New York City. (Both also published by Eerdmans and stocked here at the shop.) Rev. Gornick is the director of City Seminary of New York and Liu Wong is the Dean there; their big city, New Yorker friend Timothy Keller wrote the foreword. Together they’ve offered this lovely little paperback that describes what is happening in the urban church around the world and how, together, many are helping create a more flourishing culture and a better world. This book is for those who are living, seeking to live, and hoping to sustain lives of joy and purpose in the city through practices that undergird thriving faith in a 24/7 urban world. Whether in a changing neighborhood where new restaurants and creative businesses are arriving, in a community where lives are always in the balance, or in a place of prime real estate and executive offices, the vocation of urban Christians begins with being and staying present to God in the local context, attending to what is in front of us with all of our sense. Ministry is theology ‘on the ground,’ asking and answering the complex questions of faith and life, work and home in a dynamic, constantly changing urban world. 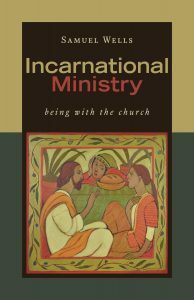 Incarnational Ministry: Being With the Church Samuel Wells (Eerdmans) $22.00 I suppose this book is mostly for pastors and those in full-time church work, but I have been deeply moved by a few of the chapters I’ve read so far. I already can’t wait for the sequel next season which will be called Incarnational Mission: Being With the World. Anyway, this new one about ministry in the church explores the significance of what Wells suggests might be the most important word in the Christian faith – with. The Archbishop of Canterbury, Justin Welby, says that Wells is “one of the finest priest-theologians of our time” and notes that he “weaves together deep theology with the practical heart and skill of a pastor.” Incarnational Ministry: Being With the Church is a beautiful book, including lovely meditations on God being with us, on us being more fully present to God, and, further, what it means to be with self, others (including the troubled, the hurt, the afflicted, and challenged) and creation itself. Wells offers eight dimensions of being with – presence, attention, mystery, delight, participation, partnership, enjoyment, and glory. These vivid narratives and wise reflections “will challenge readers to deeper discipleship and more vital ministry.” Incarnational Ministry: Being With… is highly recommended for one and all. 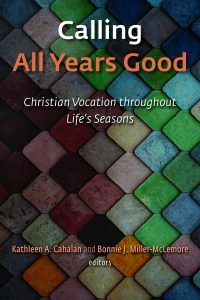 Calling All Years Good: Christian Vocation throughout Life’s Seasons Kathleen A. Cahalan & Bonnie J. Miller-McLemore (Eerdmans) $20.00 This book came out late this summer and I’ve been wanting to tell you about it. Wow. It fills a real need in the on-going development of the literature on vocation and calling and it compiles thoughtful essays about vocation and calling throughout, as the title says, various ages and stages in life’s journey. Do infants have a vocation? Do Alzheimer’s patients? What is the calling of the child or the retired worker? This book really addresses a gap in the work being done in this important field. A connecting theme of the thoughtful pieces is that vocation “emerges and evolves over the course of an entire lifetime.” That’s obvious, or should be, but yet we’ve not given much of an account of that and theologically we’ve locked ourselves into language about vocation and calling that excludes those who aren’t “making a difference” or working in a culture-shaping career. 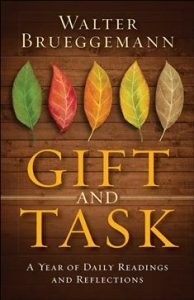 These authors broaden our language and thinking about vocation by covering six of life’s distinct seasons, weaving together personal narrative, developmental theory, case studies, and spiritual practices. The contributors are Christian educators and theologians from across the theological spectrum, each with insight and wisdom about their particular specialty or ministry context. 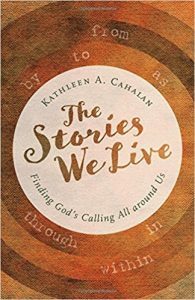 Dr. Cahalan is a professor of practical theology at Saint John’s School of Theology and Seminary in Collegeville MN – her most recent Eerdmans title is a small delight called The Stories We Live: Finding God’s Calling All Around Us. (She also did a remarkable work which we stock which explores notions of vocation and calling in each of different world religions and within diverse worldviews. How ‘bout that?!) We’ve met Miller-McLemore, who is a beloved educator and Professor of Religion, Psychology, and Culture at Vanderbilt and she is impressive. I really appreciated her major, thoughtful volume Christian Theology in Practice: Discovering a Discipline. Anyway, these two women are expert thinkers and have this gift of helping offer scholarly theological work to enhance our wisdom for living in the world in faithful ways. Calling All Years Good is a book that will help us all. 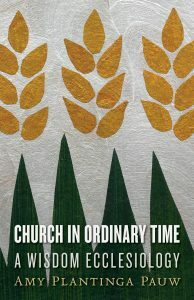 Church in Ordinary Time: A Wisdom Ecclesiology Amy Plantinga Pauw (Eerdmans) $20.00 At a recent retreat of small town pastors, lay preachers and down-home congregants of very small and often rural churches (they call it, in good Scottish Presbyterian-ese, the “Wee Kirk” conference) I announced this book and made a dumb quip, suggesting that if you get what a “wisdom ecclesiology” is, then you’ll surely want this book. And if not, just skip it. I regret having said that. Yes, this is as fairly demanding read, and yes, Amy Plantinga Pauw – related to that Plantinga, one of the most respected philosophers in the world! – is one very sharp cookie. She is one of the most brilliant theologians in the PC(USA) and holds the Mobley chair of Doctrinal Theology at Louisville Presbyterian Seminary. She wrote The Supreme Harmony of All: The Trinity Theology of Jonathan Edwards that Edwards’ scholars are still talking about. But demanding and heavy as this may be, Church in Ordinary Time is a great book and one we should seriously consider. I want to suggest it should be widely read, carefully, slowly. It’s worth it. 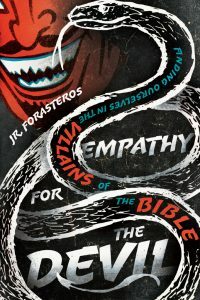 Here is how our always-helpful Eerdmans sales rep pitched it to me, and why I ordered a big stack: “Much of Christian theology,” he reminded me, “is focused on the story of Jesus and the promised consummation of all things that Christ will bring – but the church exists in the gap between them.” That reminds me of the line I often cite, saying we live in the “already and not yet.” Within the last weeks I’ve been with people who announce a Kingdom theology that suggested it was all here, now. And with other folks lamenting with little hope, as if it is all distantly “not yet.” A balanced view of living well between Christ’s resurrection and the eschaton – which is, generally speaking, the project of N.T. Wright, for instance – takes much improvisation, cultural discernment and faithful patience. In a word, we need wisdom. Not every book comes with a rave endorsement by brilliant theologians such as Willie James Jennings at Yale. He calls Amy Plantinga Pauw “one of the leading American theologians of our generation” and says to read Ordinary Time to find out why. I hope you do. 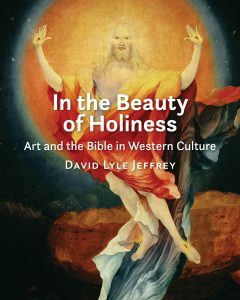 In the Beauty of Holiness: Art and the Bible in Western Culture David Lyle Jeffrey (Eerdmans) $49.00 This is an amazing book and I suppose it doesn’t fully fit into this list, since we’ve selected titles for your that are accessible for all, thoughtful but approachable and of wide-ranging interest for any educated reader. This is certainly good for anyone and we might wish that every home would have a book like this on their coffee table. Church libraries and businesses and medical waiting rooms, too, for that matter, could proudly display it somewhere to bless casual browsers. But, alas, we realize it may be a bit specialized – aesthetically-attuned, theological art history maybe isn’t for everyone – and it is expensive. Still, this is simply glorious and a book of visual theology through wonderful paintings from throughout all of Western culture. Dr. David Lyle Jeffrey is highly regarded and deeply respected for his astute observations and scholarly writing – he is a Distinguished Professor of Literature and Humanities at Baylor University. This over-sized, weighty book is manufactured with heavy stock glossy paper, richly illustrated and – as Robin Jensen of Notre Dame says – is a “truly learned study of the complex relationship between visual art and Christian theology.” William Dyrness says readers will “come away instructed and inspired by this cornucopia of imagery.” What a beautiful, wondrous, extraordinary volume. Three cheers for Eerdmans and their willingness to bring out such extravagant, beautiful, and wise resources. We hope you consider this, and hope you consider getting it from us. 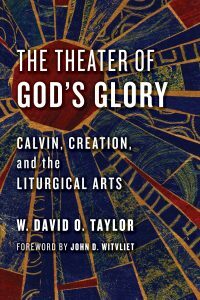 For some, Calvin would be the last theologian from whom we might expect wisdom on the liturgical arts. But David Taylor, with exemplary skill and clarity, shows us otherwise. This is an immensely important study from one of the key leaders in theology and the arts today. Do you recall what I said at the outset, that Eerdmans is a splendid publisher that, besides doing super serious Biblical commentaries and heavy theology texts for the academic guild, they also do these extraordinary volumes for all sorts of thoughtful readers? I implied that we really enjoy stocking these kinds of books and that Hearts & Minds fans, who I gather like us for our diverse and intentionally curated selection, should support our efforts to sell these kinds of titles. I’m told that many so-called Christian bookstores simply don’t carry this stuff. What a shame. We aren’t doing well stocking them, actually, to be honest, so if you care about this caliber of publishing, help us spread the word. There are great, great books out there, and we have ‘em. Let’s hope they end up in book clubs and Bible studies and campus ministry libraries and on pastor’s lending shelves, and in the bedrooms and living rooms of many. Can you help us get the word out? Might you buy some today and spread this good news around? Thanks for caring.